We are excited to share our Keto Reboot Review with you! You’ll learn what to expect during the 60 hour cleanse, as well as some helpful tips for those of you looking to take on the reboot yourself. This Keto Reboot review is broken down hour-by-hour so you’ll be able to come back to it as a helpful guide if you decide to try the reboot yourself. WHAT IS THE KETO REBOOT? The Keto Reboot is a 60 hour fasting cleanse designed to reprogram your long-term metabolics into a fat-burning mode starting with a System Reboot. The products that come with the Reboot Kit provide the technology and science necessary to help you reboot your internal operating system. 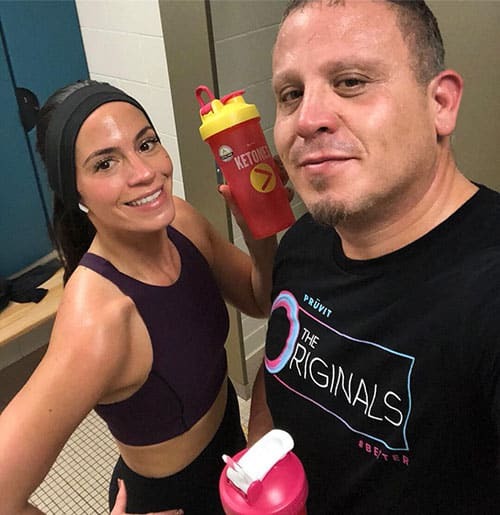 The program starts by removing caloric energy from food sources in your body over a 60 hour time period, which is then replaced with ketone energy generated through each product that comes in the kit. 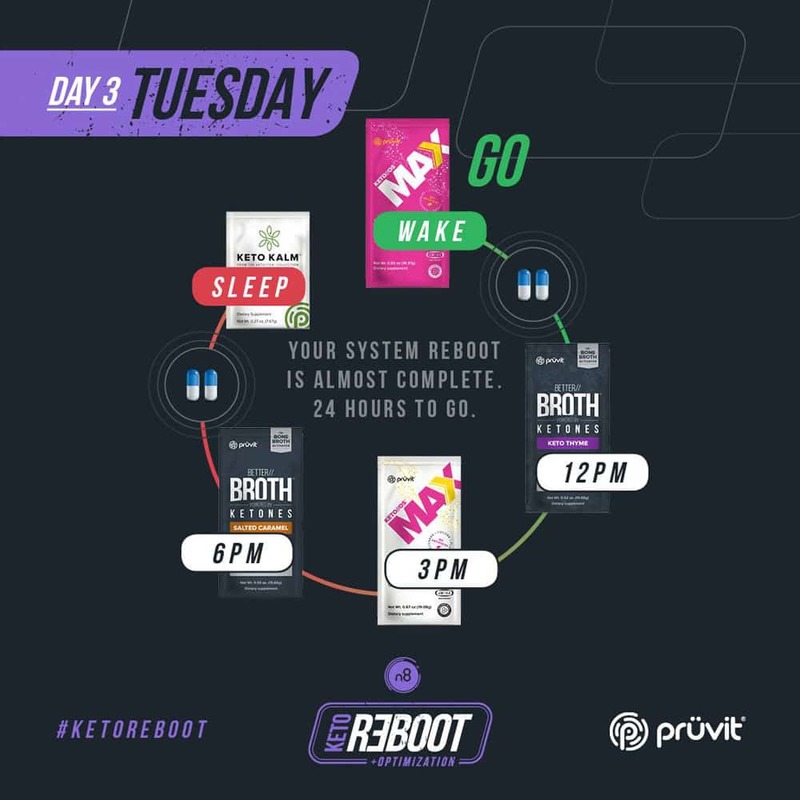 The Reboot Kit comes with four ketone-based supplements; SIGNAL//OS, KETO//KALM, BETTER//BROTH, and KETO//OS MAX. You can find out all the product details in our article explaining the benefits and ingredients of each product. The first day of the 60 hour reboot begins Sunday evening about an hour before sleep. The reason the reboot starts in the evening, and not first thing in the morning, is to break up the reboot over a period 4 days (Sun night to Wed morning). This allows for more sleep hours during the entire duration so your body has more time to heal and take in the benefits of the products. Plus, by the time you wake up on day 2, you’ve already slept several hours into your 60 hour journey! 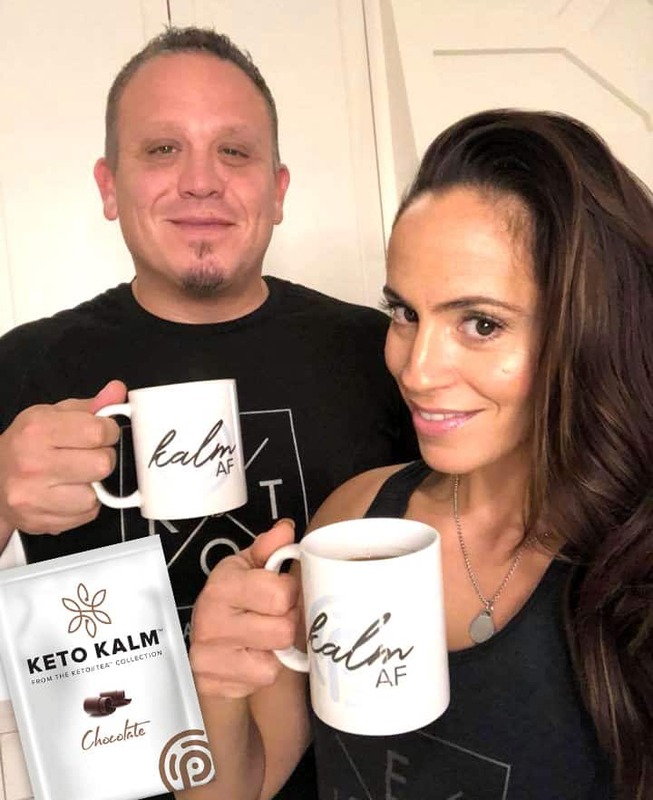 We drank our chocolate KETO//KALM Tea an hour before bedtime, and took the SIGNAL//OS capsules with a glass of water about 15 minutes before bed. The combination of the 5-HTP in the KETO//KALM, along with the DNA repair in the SIGNAL//OS capsules, gave us both a great night’s rest. The chocolate KETO//KALM tea was delicious, however, it was also very sweet. We found that by adding more hot water, we were able to get the flavor just right. HELPFUL TIP: You may be tempted to eat a large dinner before starting the reboot, however, we recommend keeping it lighter and eating at least a few hours before you fall asleep. This will help your body burn off the glycogen storage faster. Upon waking from a better than normal night’s sleep, we immediately drink our first serving of KETO//OS MAX Raspberry Lemonade. 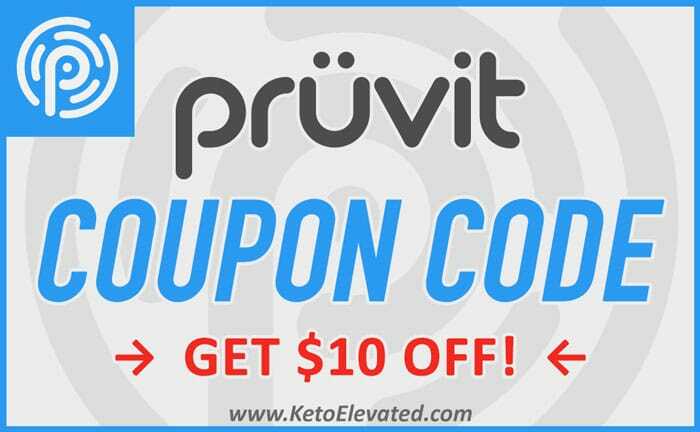 This is by far one of the most tasty flavors of Pruvit ketone supplements. The Reboot Kit comes with a caffeinated (charged) and non-caffeinated version of the MAX. Because we are abstaining from drinking coffee, we opted to take the caffeinated version in the morning. Feeling the ketones from the MAX was a nice way to start off the day and definitely provided the energy needed to jump into the day. HELPFUL TIP: Don’t chug the KETO//OS MAX as it may cause an upset stomach. We recommend drinking it ice cold over a 30 minute period. By the time lunch rolled around is when the first hint of hunger started setting in. 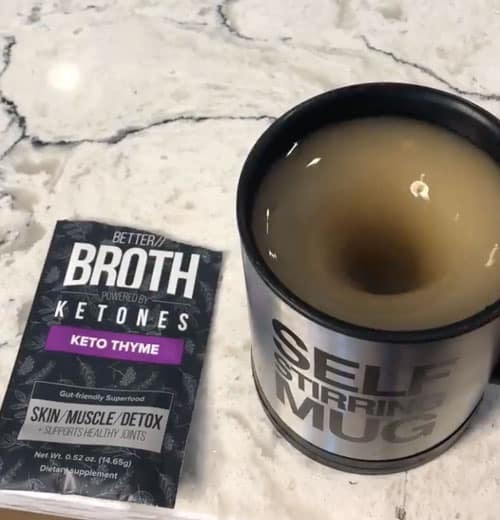 Which is why we were excited to try the keto bone broth, BETTER//BROTH. The program advises to take the Keto Thyme flavor first, so we went with that. We boiled some water and then let it cool for a few minutes before mixing (as recommended). The keto broth was very savory. Enough to subdue our appetites. We definitely felt those collagen proteins and B vitamins working! HELPFUL TIP: Take the SIGNAL//OS capsules with the broth to help against getting any sort of upset stomach the capsules may cause. After a few hours of drinking the keto broth, now it’s time to have a serving of the caffeine-free KETO//OS MAX Raspberry Lemonade. It was great being able to feel the energy of the MAX ketones again in the afternoon. It helped to keep our minds off of food by going for a quick 15 minute walk. Evening rolls around and it’s time to try the BETTER//BROTH Salted Caramel flavor and take our second dose of SIGNAL//OS capsules. While my husband was a little more hungry than me at this point during the reboot, I was surprisingly doing better than I thought I would be at this stage. The contents and salty/sweet flavor of the broth was very welcoming after not eating for 24 hours. 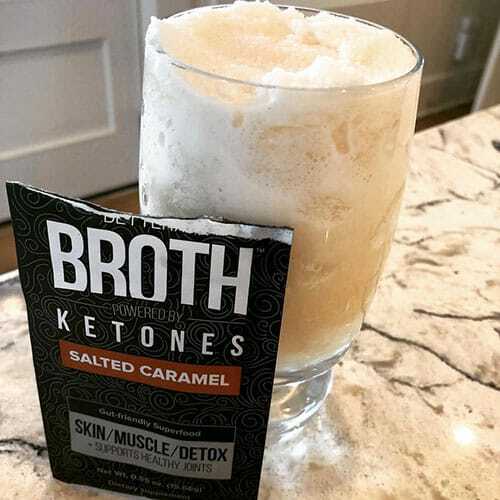 HELPFUL TIP: The Salted Caramel keto broth tastes best well shaken over ice! We’ve made it through the first 24 hours! Tonight’s KETO//KALM Tea is the Caramel Apple flavor. I have to say that this is my favorite over the Chocolate. Not as sweet but still enough to suppress our food cravings. The Keto Tea can be consumed hot or cold, but I recommend drinking it hot. At this point during the cleanse, the Keto Reboot hasn’t been as hard as I thought it was going to be… so far. We already went over each product that comes in the Keto Reboot kit on Day 1 & 2, so I want to summarize Day 3 of our Keto Reboot review based on the most important takeaways and describe how our bodies felt throughout the day. Upon waking on day 3 we realized our sleep wasn’t as good as the first night, however, now being 33 hours into the Keto Reboot, can’t complain too much. The KETO//OS MAX tasted so good this morning. Stomach is rumbling a bit, so we went for a quick 15 minute walk and drank a couple bottles of water which helped to satiate our appetites and get our minds off of food. First serving of BETTER//BROTH for the day and SIGNAL//OS capsules. I tried drinking the Keto Thyme flavor cold this time, and wasn’t as good as when served hot. HELPFUL TIP: In addition to drinking plenty of water, it’s always good to have Pink Himalayan salt on hand. If you get a headache, or feel a little week, you can consume a pinch of salt to help. Time for another serving of KETO//OS MAX caffeine-free, and a quick workout at the gym. We found exercising was great to get our minds off of food. Even a light walk helps. It just helps to move. If you are a musician, play some music. Staying busy and active is a great way to keep your mind focused on the 60 hour goal. Another round of the delicious Salted Caramel BETTER//BROTH and SIGNAL//OS capsules. The Salted Caramel keto broth is sooo delicious. It’s almost like drinking a small meal. As we head into the evening, the broth has hit the spot. Being on hour 45 so far this definitely doesn’t feel much like fasting! Hunger has set in a again, but drinking a bottle of water and taking the final serving of KETO//KALM Caramel Apple Tea has helped satisfy enough to be able to fall asleep without being hungry. Looking forward to completing the reboot tomorrow! It was a bit slow getting up in the morning, but WE DID IT!! We made it through the full 60 hours of fasting. We shifted our bodies from a sugar dependent metabolism to a ketone optimized metabolism. It wasn’t easy, but it was so worth it. We underestimate ourselves all the time, but NOT anymore. To break the fast we had some nicely seasoned sunny-side up eggs with a cup of warm homemade chicken bone broth. 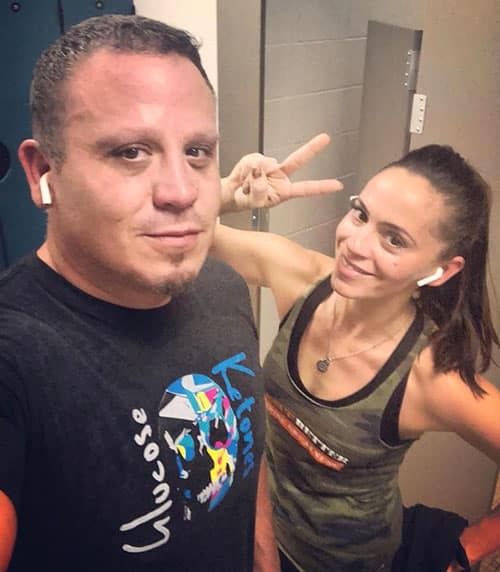 And to celebrate our success with crushing this 60 hour Keto Reboot, we had a gym date! Now that is has been a full 24 hours since completing the 60 hour reboot, there have been some definite changes we’ve noticed. The biggest difference was how much better we slept last night. Less tossing and turning for sure. Upon waking up, I was able to get right out of bed without that groggy feeling. It’s hard to describe, but I felt lighter on my feet. Mental clarity has been better too. We both feel less foggy and have more energy and focus to get things done at work and around the house. While neither of us had significant weight-loss, we didn’t expect it in only 60 hours. The Keto Reboot is designed to set the body up for fat-loss and optimal function very quickly, as long we continue to eat and live healthy. The reboot is a great way to have an easy fast while depleting our glycogen storage (sugars and carbs). That is the key to faster fat-loss and living off of a pure and healthy ketone energy. UPDATE 4/18/18: After completing the Keto Reboot for the 2nd and 3rd time now, each time I’ve lost around 5lbs, and Josh lost a whopping 10lbs! Watch our updated video at the top of this article about our latest Keto Reboot review. I’m not sure we would have been able to complete the 60 hour fast without the amazing Pruvit keto products that come in the Reboot Kit. Having tried a 60 hour water-only fast in the past, it was VERY difficult to even get past 48 hours. The Keto Reboot kit retails for $79 and can be purchased via the Pruvit Online Store. At times, we both felt we could have failed during the reboot. It was staying plugged into the Keto Reboot Facebook community that helped to hold us accountable and provide the extra support to finish strong. Water, water, water. Drinking lots of water, at least a gallon a day, helped to subdue our appetites. Taking the keto reboot products during the recommended times helped to keep our bodies full of energy throughout the day. Staying busy and active actually helped us to forget about food more than it increased our appetites. Setting up multiple alarms on our smartphones prior to starting the reboot helped to us to follow a strict schedule of when to take each product. Now that we have completed the Keto Reboot, it’s the best time to continue to optimize our bodies, and not stuff our faces with unhealthy food or drink. 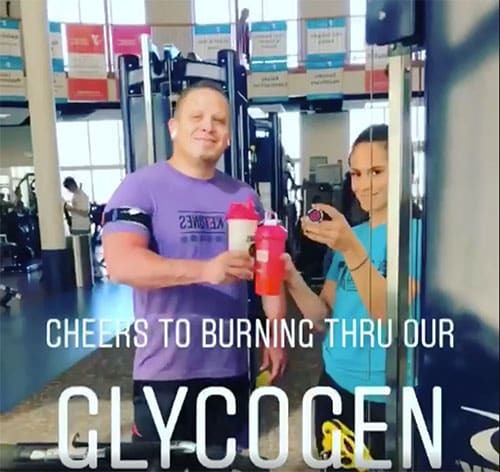 In addition to regular exercise and eating healthy keto-friendly foods, adding exogenous ketones into our diet will continue to be a daily thing. Thank you for taking the time to read our Keto Reboot review! Head on over to the Pruvit Online Store and grab yourself a Keto Reboot Kit before the next reboot starts! NOTE: This review was written by Josh and Andrea Rapkin as part of the KetoElevated.com team. DISCLAIMER: This Keto Reboot review is based on our personal findings of the Keto Reboot Program by Prüvit. The information provided relating to the 60 Hour Keto Reboot is for informational and educational purposes only and, any use thereof, is solely at your own risk. Under no circumstances should the 60 Hour Keto Reboot dietary and exercise programs, or Prüvit products, be applied instead of medication or medical advice without first consulting a prescribing health care professional for a recommendation.